1. Don proposed to Megan. WHAT. THE. HELL She's sweet, and beautiful, but this was so random to me. He just dropped Faye like she was hot. And she is hot - freaking smoldering inside and out. This seriously shocked me. I think it revealed that Don is to his breaking point for companionship and stability. Things are crazy in all aspects of his life and Megan represents calm and stability. Those aren't usually the qualities one looks for in a much younger wife, but this is Don after all. Who knows what he's thinking? I also can't believe he had the nerve to give her Mrs. Draper's ring. Megan is the anti-Betty and better not let me down. 2. Joan is still pregnant?!?! I'm not really that shocked, but more excited. I had a feeling she still had a bun in the oven, but Manfriend and I both had some questions about this. She made it very clear to Roger that there was NO WAY (timing-wise) that the baby could be her husband's - or anyone but Roger's. Now, she's chatting her her hubby about how she "isn't showing yet." I'm a little confused on the timeline here. Either way, Roger is going to be crushed. I'm glad she kept it, she deserves some happiness. 3. Betty Francis is a total crazy person. For reals, though. She is such a nutbag that it astounds me. She is so jealous, calculating, childish and attention-crazed. I can't figure out what her problem is. She feels like she's constantly being attacked by everyone, and in reality she has it pretty good. I think Henry is about done with her. He just flat out doesn't understand what the heck she is thinking - ever. Also, firing Carla? What a B. I don't think her wackjob-ness would be so alarming if she weren't so beautiful. I like how much January Jones brings to the role besides just her pretty face. 4. Glen, the neighbor boy, is just creepy. But the weird thing is that he's creepily wise. 5. Peggy is my hero. She is a total badass mofo. This season she did drugs, had a few boyfriends, got rid of her bangs, stripped naked to shut up an a-hole and saved the company. And, she was the only one with the sack to give Don the obligatory "WTF" confrontation about Megan. We were all craving it. She's a rockstar. 6. That tender moment between Don and Betty at the very end was kind of jarring to me. Betty and Henry FINALLY moved out of her and Don's old house in Ossinig. They accidentally crossed paths in the empty house and shared a cocktail. I couldn't decide if the drink was them mourning the loss of their idealistic suburban paradise or them celebrating that they're done with each other once and for all. Whatever it was, it was awkward how tense she got when he told her he proposed to Megan. She's such a brat. I sense some unfinished business between Don and Betty. I hope next season she tries to seduce him back, leading to a fist fight between her and Megan. All in all, I'm pretty pleased with how everything went down. When the show picks up next season there are lots of juicy new plot lines. I'm feeling a little bit weird about not having any Mad Men to catch up on. I started with season one at the beginning of the summer and have steadily been watching at least one episode per week since then. I feel like a good friend moved away. What's a girl to do? PS: Don't forget to check out Mingle Monday over at Life of Meg. It's a cute blog hoppy game. If you're visiting me from there, WELCOME! I spend 39 weeks of the year waiting for Mad Men to come back so I can enjoy it for 13 blissful Sundays. 38 weeks, 6 days to go! The season finale was incredible. No season finale has disappointed yet, though. I have some sympathy for Betty just because she is so hopelessly misguided and tortured. The baby is Roger's; he'll go nuts. And I am really interested to see how they tease out Peggy (yes, total effing rockstar) and Don's friendship. There is a mutual respect there, but I think it runs deeper for Peggy. 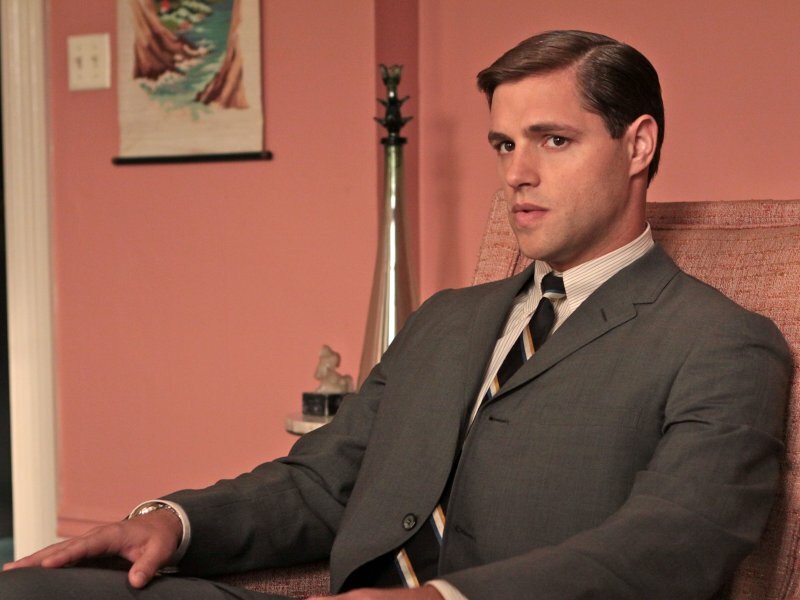 I worship at the temple of Mad Men. Best show on TV. Casey!!! Hi back from Mingle Monday. Thanks for visiting my blog. I just lurve your blog, too! And the shared obsession that we both have for Mad Men. I also started Season 1 at the beginning of the summer and didn't get caught up with it until about the third or fourth episode of Season 4. What are we gonna do without it??? And yes, Peggy is awesome! So glad you posted about Mad Men. It is my absolute favorite show. I have to say...I think Don made a good choice with his secretary...I didn't really see any chemistry between him & Faye. I also was glad they gave Peggy more time this season, and I had a feeling Joan was preggers. I can't wait to see how the next season plays out. I'm betting that Betty Draper will be freshly divorced & Don will be married but not happy. 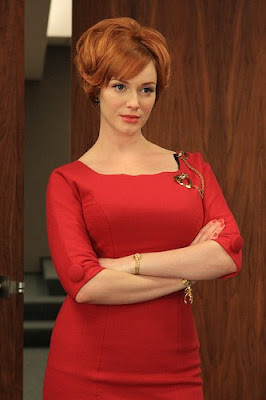 Oh, how I love Mad Men! !